I like to film nature. Whether it is a new batch of baby birds or new raccoons, it does not matter. Each are different in their own way. It is fun to watch how they stick close to their mom. be ready to flee when you sense danger. out their babies to show off soon. What can I say? I better make sure I have enough sd cards. Gray is a nice color to work with when making jewelry. neutral color to blend with. have a nice polish to the gray shade. want to believe is up to you. shine that is not too over powering. 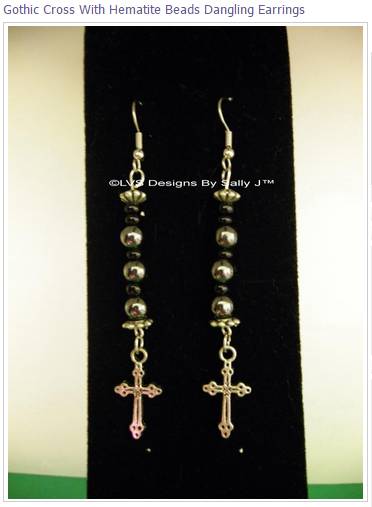 These earrings have genuine hematite and glass beads. Featuring a dangling silver tone gothic cross. Earrings measure 3 1/8 inches long. These pierced earrings have hypoallergenic surgical steel earring wires. Best thing about these gray beads is what I think about jewelry. Jewelry should never take away from you. You are the star.